Te Rapa racecourse erupted on Legends Day when On the Rocks (4 h Alamosa – Cold Shoulder, by Volksraad) scored a commanding win in the $400,000 Herbie Dyke Stakes (Gr. 1, 2000m). After three stakes wins at Ellerslie, including the Avondale Guineas (Gr. 2, 2100m) and more recently the Rich Hill Mile (Gr.2, 1600m), the cracking grey entire produced a milestone victory: the first Group One for co-trainer Pam Gerard and the 50th for training partner Mike Moroney. “It’s my 50th Group One winner and great to share it with Pam,” Moroney said. “It’s her first, so it’s worked out perfectly. We went close with Savile Row finishing runner-up three times in Group Ones. “Pam and the team have done a great job with him. They’ve nursed him back after he had bone chips going into the (NZ) Derby. Pam works incredibly hard running the stables at Matamata, very hands on, and Group One success is just the boost she needs. “It was a very good effort by the horse and a very good ride by Jake (Bayliss). He stayed off the rail, everything worked in his favour and it was a good tough win. On the Rocks has won five of his 12 starts and $432,575 in prize money. 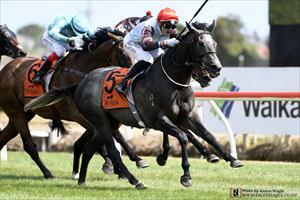 Having strapped Ocean Park (Thorn Park) colt Arrogant to finish second in the Waikato Guineas (Gr. 2, 2000m) earlier on the programme, On the Rocks was the icing on the cake for Gerard. “I’m so happy for all the people that supported us, and Jake (Bayliss). He’s a great little horse, been a bit underrated all the way through but what a heart he’s got,” she said. “I had to fight with Mike to keep him as a colt and I only wanted to leave him as a colt because he was a little bit quiet. I thought that bit of edge might make him as a racehorse. He’s never been colty at all. It’s just race day he gets a bit excited. I guess his emotions get up, like we do, but once he gets a saddle on he’s really professional. Owned by Andrew Clark, David Sinn, Adrian Mathieson, Noel Gurney, Richards Sims, Mount R.S.A Racing Syndicate, Ballymore (NZ), George Alas, Jim Bebedellis, and John McNicholas, On the Rocks was selected by Paul Moroney and purchased for $40,000, from the draft of Wellfield Stud, at the 2016 New Zealand Bloodstock Select Yearling Sale, a descendant from the family of Melbourne Cup winner and champion Australian staying horse Efficient (Zabeel). Following his super win in the Rich Hill Mile on New Year’s Day, On the Rocks was heartily favoured for the Thorndon Mile (Gr. 1, 1600m) on 19 January at Trentham, but a weight penalty to 57kgs and conditions of the race worked against him. While the weight-for-age scale in the Herbie Dyke saw quite an impost (59kgs), it did even things out and combined with his appreciation of the distance he relished the task. Bayliss had On the Rocks travelling sweetly in fifth and looked to be in an ominous position tracking a three-way duel into the straight. Sprinting into contention at the 200m, he sailed to the front and won easily under a victory salute. On the Rocks won by one and a quarter lengths, in 2:03.2 for the 2000 metres and paid $15.10 & $2.90 on the NZ TAB tote. “What an incredible horse and he’s taking Pam, the owners, and me, on a great journey,” Bayliss said. ‘He’s as tough as nails. We had a question mark after the last run, but he got the job done and he’s won one of the most prestigious staying races in New Zealand, the Herbie Dyke. Accepting accolades on behalf of the owners, Adrian Mathieson said: “Pam said he was training well and had every chance, and it’s a pretty special day for a lot of people. It was a great performance today. On the Rocks was strapped by Scott Magee.